We have noticed two types of ads being used by The Oregonian and the Seattle Times that gaining expansive use. 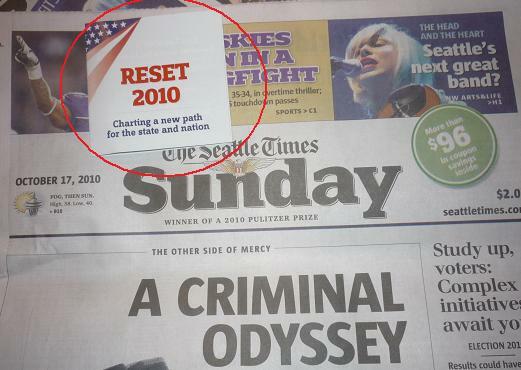 During the election the Seattle Times used post-it note ads where the ad is a pealable sticker pasted on the front page of the newspaper. In this case, the sticker is a miniature fold-out brochure. The Oregonian:The Oregonian has widely used full page ads that cover half of the front page of the newspaper. This type of ad which layers over the news is the most coveted newspaper ad spot in the state as any newspaper reader cannot help but see the ad. Now we notice that The Oregonian is increasingly using the same full page cover ad to cover sub-sections of the newspaper. 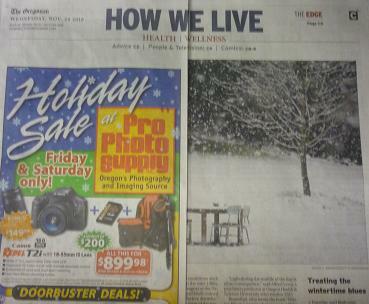 Below you can see how the holiday sales ad covers half of the front page of the How We Live section. Advertising is taking up more space in the newspaper as a innovative way to boost spending in light of decreasing print subscription sales. Posted: November 24th, 2010 under Uncategorized.